Gift of Loren G. Lipson, M.D. Artist Wendy Red Star works across disciplines to explore the intersections of Native American ideologies and colonialist structures, both historically and in contemporary society. Raised on the Apsa’alooke (Crow) reservation in Montana, Red Star’s work is informed both by her cultural heritage and her engagement with many forms of creative expression, including photography, sculpture, video, fiber arts, and performance. An avid researcher of archives and historical narratives, Red Star seeks to incorporate and recast her research, offering new and unexpected perspectives in work that is at once inquisitive, witty, and unsettling. Intergenerational collaborative work is integral to her practice—her daughter Beatrice Red Star Fletcher (now 10 years old) often collaborates with her. Red Star is committed to creating a forum for the expression of Native women’s voices in contemporary art. Wendy Red Star lives and works in Portland, Oregon. The title of this work in the Four Seasons series is Indian Summer. What does the phrase “Indian summer” mean? Why do you think Red Star chose it as the title? How does the title contribute to her project of using humor and irony to challenge stereotypes? Look closely at the image. List all of the objects and materials that you can identify. What details did you first notice that told you the props and the scene were artificial? Although the setting and props are made from artificial, mass-produced materials, Red Star’s clothes and beadwork were created for her by friends and family. Traditional Apsa’alooke elk-tooth dresses, for example, symbolize wealth and honor and are worn on special occasions. Lance Hogan made this dress for Red Star in 1997 when she was a princess at the annual Crow Fair. Why do you think Red Star chose to include these personal items in Indian Summer? How do these elements contribute to the piece as a meditation on identity? 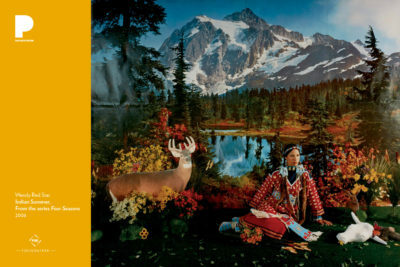 Compare Wendy Red Star’s Indian Summer (2006) to Charles Heaney’s painting Mountains (1938), also included in the Poster Project. These artists have each chosen to depict western United States mountain scenes—yet with very different materials and intentions—75 years apart. If these artworks could have a conversation, what do you think they would say to each other? Wendy Red Star and Dr. Steven Zucker, “Wendy Red Star, 1880 Crow Peace Delegation,” in Smarthistory, March 21, 2018, accessed May 23, 2018.